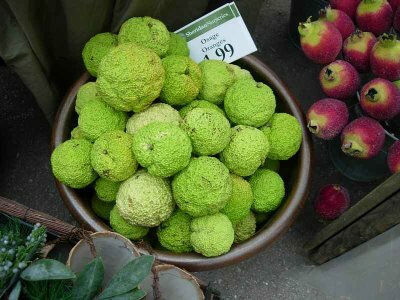 Osage orange | Random Thoughts: If not now, when? 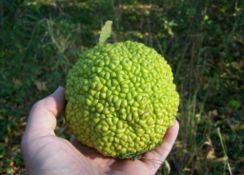 I know of two, perhaps three, fruiting Osage Orange trees. Now is the time of year to find them, when their large, green fruits are visible and falling around the trees. I stopped by the two I’m sure of today (on Former Highway 58) and looked at the fruit, which is a large, wrinkled ball with hundreds of tiny seeds inside. As long as I can remember, the property where they grow has been vacant, not abandoned, but cultivated and without buildings except for an empty silo. Now someone is building a house there, well back from the road near the old silo. I hope that they value their two old trees and don’t cut them down. I was a bit worried about them anyway, because it looks like a young mulberry tree has sprouted in the main crotch of one of them. Today I looked at the other and found mulberry sprouts there, too. One tree is obviously healthier than the other: its fruits are larger and about twice as heavy. The wood of the Osage orange is unusually tough and dense, like yew but perhaps not as springy. It was used by the native Indians to make bows. Later, because of its thorns, it was planted as a natural hedge to keep livestock in or out. Update: I found a basket of them for sale as ornamental, uh, objects at a large garden nursery in Toronto. Hi, i have seen a small grove of Osage orange on the old Christie Cookie plant on Lakeshore east of Parklawn….in the fall the fruits are on curbline as you exit lakeshore eastbound by the old plant. That’s very neat. Did you know that they were probably propagated by the giant ground sloth eating the fruit and excreting the seeds?